The next CMS talk will be on 20 Feb 2013 (Wednesday), 2pm. 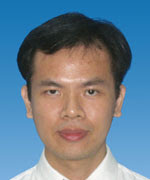 The speaker is Dr Liew How Hui from Department of Mathematical and Actuarial Sciences, UTAR. Venue : SD 102, UTAR KL Campus, UTAR, Setapak, Kuala Lumpur. Singular Value Decomposition (SVD) is a very important numerical tool in linear algebra and data analysis. Firstly, linear algebra problems will be introduced. Secondly, a useful tool in data analysis called principle component analysis (PCA) will investigated using an example. Finally, application of SVD to PCA will be mentioned.